Heat oven to 375°F. In small bowl, mix egg and taco seasoning mix with fork until well blended; set aside. Spray large cookie sheet with cooking spray. Separate crescent dough into 8 rounds; unroll into strips. Fold each strip in half; starting at folded end, twist 2 to 3 times, leaving 1 inch untwisted on other end. Place on cookie sheet. Using a paring knife or kitchen scissors, cut each untwisted end to make 4 claws. Cut a small slit in each claw. Place 1 cashew in each slit; press to seal cashew in place to make nail. 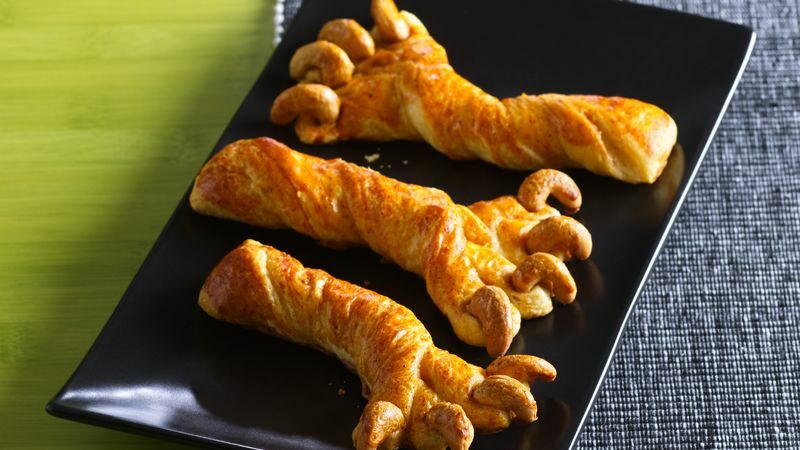 Brush entire claw with egg mixture. Repeat with remaining ingredients. Bake 10 to 12 minutes or until golden brown. Immediately remove from cookie sheet. Even at room temperature, these claws taste yummy. Pack them with your child's lunch for a frightfully fun surprise. Serve these claws warm, with a hearty bowl of soup or chili.